From time to time, I’ll skim the links referenced in Real Clear Religion. This past Tuesday, I came across a link to a featured post at Ministry Matters from Shane Raynor entitled Mental Illness and Spiritual Evil. Let me be clear. I believe mental illness is real. But I also believe that demonic influence, oppression, and in severe cases, possession are real too. Although mental and spiritual issues are two different things, we’d be both naive and foolish not to consider the connection between the two. I’m convinced that, in more cases than we’d like to admit, they feed off each other. The Roman Catholic Church is upping it’s game on this. Many dioceses are training more priests in exorcism and deliverance, and earlier this year, the Vatican legally recognized the International Association of Exorcists, an organization of Roman Catholic Priests who perform exorcisms. The rise of occultism is considered a contributing factor for the increased demand. World famous Vatican exorcist Father Gabriele Amore one of the founders of the IAOE claims to have been involved in treating more than 70,000 cases of demonic possession. Whether or not you agree with the Roman Catholic theology or methodology, you have to admit that at least Catholics are doing something to deal with an urgent problem of the churchwide level. What are the Protestant denominations, particularly the mainline churches, on this issue? The church insists that the majority of people who claim to be possessed by the Devil are suffering from a variety of mental health issues, from paranoia to depression. Priests generally advise them to seek medical help. But in a few cases it is judged that the person really has been taken over by evil, and an exorcism is required. Including the time I spent in my general psychiatry residency and child psychiatry fellowship, I’ve been treating kids and families for a little over 28 years. In those 28 years, there was one time that I entertained the possibility of demonic influence…this particular patient was probably the most severely traumatized kid I’d ever cared for, having been removed from parents who were heavily involved with occult practices. To suggest that demonic influence in any way may account for the increased prevalence of mental illness on a website that serves as a resource for thousands of pastors and church leaders has great potential for harm. More people in the United States seek mental health care from pastors than psychiatrists or primary care physicians. Nearly a quarter of those who seek help from clergy in a given year are experiencing the most impairing mental disorders. Most of those are never seen by a physician or mental health professional. The first time I encountered a pastor at a ministry conference who insisted that kids with autism are demon-possessed, I was so startled I had no idea what to say. But kids can…and do get hurt by this thinking. Check out this article from Indianapolis Monthly (starting at Page 94) about an young preacher in training who attempted an exorcism with a teen boy with autism. Or this story of an eight year-old boy with autism in Milwaukee who died during an attempted exorcism. Demon possession is not the reason for the increase in the prevalence of mental illness in modern society. A brief comment on Shane’s comments about the connection between mental and spiritual issues…Are there situations in which sin, or patterns of sinful behavior lead to symptoms of mental illness for the person involved in the pattern of sin? Absolutely. Are there situations in which mental illness negatively impacts the ability of a person to grow in faith? Absolutely. But we have to be EXTREMELY CAREFUL when telling people who approach the church for help that they have a sin problem (after all, we ALL have a sin problem!) when they truly have a mental health problem. Our ministry seeks to help churches minister to/with families of kids with mental illness, trauma or developmental disabilities. While we provide lots of services to churches, our role is truly to support local congregations in evangelism and outreach to a population we believe is greatly underrepresented in the church. We know that far too many people have been wounded by the church from accusation during episodes of mental illness, and we have a difficult time encouraging those who have been wounded to give church another try. Do we run the risk of misrepresenting God (see Job 42:7) when we leap to the conclusion that sin is the cause of a specific episode of mental illness without a very thorough understanding of that person’s mental and spiritual condition? 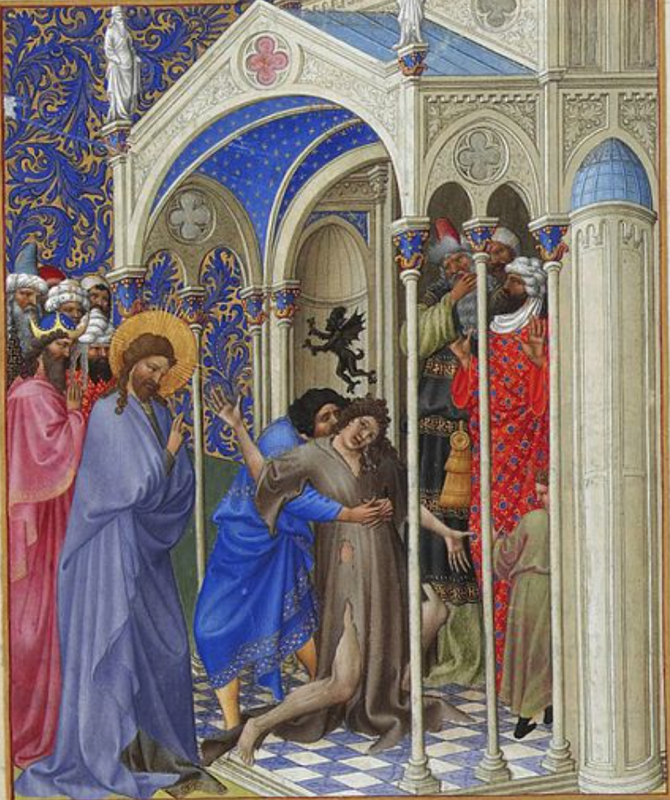 Image: The Exorcism, from The Tres Riches Heures du Duc de Berry, by the Limbourg Brothers. Key Ministry has assembled resources to help churches more effectively minister to children and adults with ADHD, anxiety disorders, Asperger’s Disorder, Bipolar Disorder, depression and trauma. Please share our resources with any pastors, church staff, volunteers or families looking to learn more about the influence these conditions can exert upon spiritual development in kids, and what churches can do to help! This entry was posted in Controversies, Key Ministry, Mental Health and tagged church leaders, demons, Key Ministry, mental illness, Ministry Matters, Real Clear Religion, Shane Raynor, spiritual evil, Stephen Grcevich MD. Bookmark the permalink. Great choice of a picture for this article! Love the medieval tone (the picture not the article)! Another great post! Why wasn’t the story of Jesus healing the blind man mentioned? He outright says that the cause of the man’s blindness had nothing to do with any sin. The situation was meant to glorify God, and I think that we can look to these challenges if a growing population with mental disabilities and find ways to glorify God in them. How we treat the mentally disabled can certainly be an opportunity to glorify God on our part by doing good for them and working to make their life more enriching. And those people may also glorify God when they show love and appreciation either for what we do for them, or most likely, for no reason other than to just reach out and love us back. There are so many hurting people in the world, and the thought of anyone even considering that God would allow demons to possess the innocent is very disturbing to me. Yes, this article is very right when the author says, “Demon possession is not the reason for the increase in the prevalence of mental illness in modern society.” And we must stick to that 100% and tell the story of the blind man and remind everyone that shining the light and loving one another is the one of the most important things we need to be doing. I think it is dangerous to even allow for the possibility of an isolated case to be considered a demon possession because there are too many misled people out there who are looking for that one green light to jump on that wagon and declare someone possessed. Very dangerous, indeed! People with mental illnesses don’t have demons, they have disabilities. They don’t need any demon taken out of them, they need love and acceptance bestowed upon them. They also need special programs to enrich their lives. And that is where it is our job to shine the light and glorify God. Thanks for your response. If your referencing the healing of the man born blind in John 9, the reason I didn’t mention it was that there was no suggestion that his blindness was due to demonic influence and that was the issue around which much of the post centered. Check out this post from Rhett Smith from a couple of years ago. Rhett is a pastor and counselor who makes a pretty compelling argument that God may often allow people to experience mental illness for the purpose of drawing them into a deeper relationship with him. I totally agree with everything you shared. Having a child who is Gypsy we would see the generational curses (witchcraft, fortune telling, etc…) that definitely did impact our child. We needed to do spiritual warfare and praying for generational breaking of those curses and for healing. It did not necessitate a need for exorcism because she wasn’t demonically taken over. However, she was being affect by demonic things which is different. With much prayer and an understanding of where some of her issues were coming from, it helped her to know why she felt attacked spiritually and having dealt with depression and other issues. We have found by doing both counsel with pastoral leadership as well as psychological counseling, it prevented very serious things and started the healing process. My prayer, even as I write my own story, that more parents and pastoral leadership would come to a better understanding of this issue. Thank you for sharing! So, this may seem odd, but I’m a atheistic-Mormon. That’s a long story. A long, complicated story. But as a child, I was raised by parents that believed at one point that I was possessed and I was–in fact– subjected to several VERY TRAUMATIC “Pentecostal healing services,” ( thankfully NEVER an exorcism). Now that I am an adult, I’ve learned the coping skills to handle life. Nobody would ever know that as a child my parents thought I was demon-possessed (and then, decided at 11 to place me in a horribly abusive foster home, but that is another long story). In fact, in hindsight, had placing me in foster care NOT been an option, I suppose that they would have, eventually tried an exorcism!). As an adult, nobody knows any of this [except my best friend & hubby of 13 years]. However, our child, whom is 12, is autistic. And the behaviors that he exhibits, while under severe anxiety, is like pouring gasoline on an fire [of maladaptive autistic characteristics]. Many of the behaviors he exhibits are the same types of things that I myself have done as a child, when he was his age. Two nights ago he had this massive meltdown at home. The end result was — while he was raging in his own bedroom upstairs — photos DOWNSTAIRS were falling all over the place. My husband and I, still learning applied behavior analysis theory, were doing our best to ignore [and NOT reinforce] maladaptive behaviors, so we were ignoring his meltdown [we knew he was safe], and we were sarcastically joking about “what IF he was misdiagnosed, that he’s not not autistic but actually possessed? I wonder if our insurance would cover exorcisms?” As we were laughing and giggling about this, the thunderstorming Florida summer weather blew down one of our power lines, so eerily the lights flickered… Which made us laugh even more. The more I watch him, the more I’m starting to wonder, if perhaps maybe, just maybe, I’m an undiagnosed Aspie myself. Perhaps I’ve learned (just through life) how to compensate for the social deficits so I might not ACTUALLY meet the quals for an actual diagnosis, but who knows? All ramblings aside, I can attest for the trauma, as a child, of being put through “pentecostal healing processes.” It was — IS — very traumatic and scary. I was tied to a board, in the shape of a cross, with velcrow straps, it was at an angle, so it wasn’t uncomfortable, just I couldn’t move. My parents TOLD me I was going to a “youthgroup party” at a new church. When the services started, the Pentecostal music was terrifyingly, overwhelmingly loud [my parents were Baptists, so I had never experienced a small-room-rock-and-roll celebration. When they asked for those that needed to be healed to come forward, I tried to run to the back of the room to escape the LOUD music, the BRIGHT lights, and the fact that people were jumping around screaming and shouting in a language I couldn’t understand completely terrified me. My father, a body builder at the time, pinked my scrawny self up and threw me in a fireman’s carry over his shoulder (like a screaming lumpy sac of potatoes!) and carried me to the front of the room, where I was surrounded by a dozen or so people, all clamoring in a religion I didn’t understand, my dad held me down to the cross thing and velcrowed me down. At first I was scared. They kept putting oil on my head. and sprinkling ((what I presumed to be)) holy water on me. At first I thought they were going to hurt me, but after 2 hours, I realized they just wanted to touch me and pray loudly and obnoxiously in and out of English to save my soul. But at 11, I did not have these skills. Once I realized they weren’t going to, like, hurt me while I was tied down, I was a bit less afraid. And after two hours of listening to Spanish-English-rambling THEY called “Tongues,” a giggle escaped. The laugh was because I was the only person in the room that realized this was INSANE. This was NOT going to heal me. This was a waste of valueable homework time, and only SLIGHTLY preferable to finishing my math homework. It was THAT thought that made the giggle escape. “thank you Jesus!!! She is now happy!!! !” They began to celebrate. This made me laugh more. Then they asked me if I would invite Jesus into my heart. It was already passed my bedtime, and I was tired and DID need to do my math homework, so out of sheer exhaustion and after being beaten down [Almost like an interrogator! ], I repeated their 3 sentence prayer that they believed would somehow heal me AND guarantee me a spot in heaven, and finally, believing fully they had exorcised my demons, they let me go home. I actually haven’t ever talked about this before now. I’m contemplating reblogging your original post, but unsure if it will fit with the theme of my website. http://Www.mypuzzlingpiece.com is dedicated to parents of autistic children who have been recently diagnosed. Because I DO try to stay away from politics and general in possible, it DOES make sense to address spirituality in the journey with autism, as this is a part of every family, every individual, and our growths as both families AND individuals. If I were to address the issue of spirituality and the journey of autism, perhaps an article talking about exorcism might not be the BEST place to start. I wonder if you have written anything about the spiritual aspects of journeying through autism, that might be something I’d like to share with MY readers, and then maybe build up to reblogging this? Because — despite my atheistic Mormon ways — it’s an important part of the journey. Let me know if you have any content on this. Perhaps you’d be willing to share, even as a guest blogger? Unless people have a personal relationship with God the Father, and an indwelling of the spirit of Christ, by baptism of the Holy Spirit, and have had encounters with demonic forces, they have no clue what is going on, and cannot distinguish the difference between the evidences of disruptions of the systematic functioning of normal and healthy behavior. If you know the character of God, you know and recognize all that is related to his handiwork, and mental illness nor demonic possessions/oppressions does not stem from God. Infirmities and maladies cannot dwell in the same space as God, because no form of darkness for that matter can withstand the presence of Almighty God. People stumble around blindly, because they refuse to kill enough of the flesh and love of the world to be able to see the spiritual side of reality and face the truth of what is evil (not of God), and what is good (all of God). I am not saying that because a loved one suffers from some form of mental illness or challenge mean that they are evil, but it is not God who have caused the ascribed affliction. In God’s eyes, Job was a perfect and upright man, but he allowed satan to afflict him, and not to mention Him giving his only begotten son Jesus, who was without sin, to take onto himself the sins of the world. So, in my understanding, all such ailments to the mind, body, and soul, are to some degree demonic possession, or oppression. To all those who don’t believe in GOD’S OMNIPOTENCE; create something out of nothing, or just wake yourself up, the next time you lay down and sleep. Barb… oh seriously…. the number of times I’ve encountered people like you who see the world in a simplistic way. That suffering is either caused DIRECTLY by God, Satan/demonic or as a result of personal sin… “So, in my understanding, all such ailments to the mind, body, and soul, are to some degree demonic possession, or oppression”… and this is how people end being “demonised” by those who don’t understand the nuanced nature of humanity! Back in the early days of Meg’s diagnosis, a very well meaning church friend suggested to me that her autism was the result of some “unconfessed sin in my own life” and that I just needed to pray to God for enlightenment regarding my OWN behavior, then she would be cured! This was back in our original support group, and this woman had a child of her own with a disability! Unreal, looking back, that she did not appear to be taking her own advice…and neither her child nor mine have had a “miracle cure” to date. Thankfully, I had enough good Biblical evidence in my arsenal to dispute what she was saying to me. I reminded her that by “claiming” a cure based on behavior (anyone’s…hers, Meg’s OR mine) went against everything we believe as Christians. And that the WHOLE point of our Christian walk is “Thy will be done”, not bargaining with God based on our personal behaviors or shortcomings…That in HIS infinite wisdom, GOD decides…and gives us what we need to survive this path. It was an invaluable lesson for me, and a good reminder, to this day. Laying blame for mental illnesses and disabilites serves no one, but it especially does not serve God. Stay far far away from Deliverance and Inner Healing Ministries as these people have no clue about mental illness! !